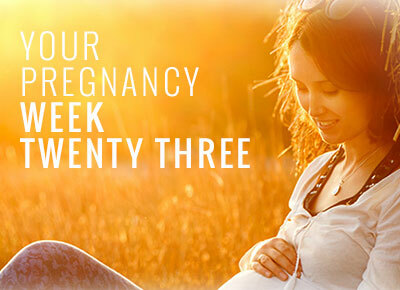 Aha mommies…you are well into your second trimester and your pregnancy is progressing well. By this time there may be several changes in your appearance. You will have a glow with all the nutritious food you are consuming and the fluids in your system. Your hair will also have more volume and shine. However, not all changes are as good. But there is absolutely no reason for concern as all this is a natural part of pregnancy and will go away once you are done giving birth. To learn more about the changes and developments this week, continue scrolling. Your baby's skin is growing more rapidly that its tissues. Therefore, the skin tends to get saggy for now. But don't worry. The sagginess will disappear once the fat cells fill in under the skin. Also, now your baby's skin is somewhat transparent and its internal organs are visible. Once the adipose tissue form, the skin will become much less transparent. All these weeks if you wanted to hear your baby's heartbeat during your check-up, the doctor used an instrument called the Doppler (You are familiar with it by now). However, by week 23 of your pregnancy, the little heartbeats can be heard through a normal stethoscope. A 3D scan may show a reddish hue in your baby's skin. This is nothing to be alarmed about. The color is due to the veins and arteries that are forming beneath the skin. Your baby is quite big now when compared to the last few weeks of development. 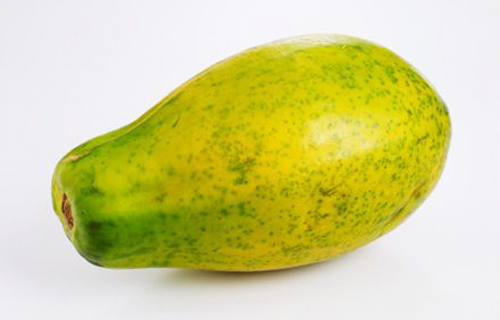 The little one can be compared to the size of a papaya. It is slightly plumper now as the adipose tissue has begun to develop. The fetus is now a little over 11 inches long and weighs over a pound. From this week onwards there will be considerable weight gain so that by the next month your baby doubles its weight. Reddish hue in your palms and feet: The reddishness of your palm and feet is a condition known as palmar erythema. Some women have it, some women don't. There is nothing to worry about this symptom as it is nothing harmful. There may be a slight itchiness in the red areas but it soon goes away after you give birth. The increase in blood volume coupled with pregnancy hormone, estrogen causes this redness. The appearance of linea nigra: Have you noticed a vertical line of hair on your belly running from just under your chest till your lower abdomen? Don't freak out. This is natural in pregnancy and is called linea nigra. This is a form of pigmentation and can be blamed upon the pregnancy hormones. It is more prominent between your belly button and pubic area. This line will fade after your delivery. Skin pigmentation: Has your facial skin become blotchy and dark? Don't panic. There is nothing wrong with your skin. This condition is better known as the mask of pregnancy. In medical terms, this skin pigmentation is termed as chloasma. It affects a lot of pregnant women. The dark patches are prominent on the forehead, cheeks, and upper lips. Again, estrogen is the culprit here. The increase in this hormone raises the production of melanin and causes the hyperpigmentation. This is the same reason why your areolar region becomes a few shades darker too. Brain fog due to pregnancy: Is your sudden forgetfulness becoming something of a legend in your family? Relax. Feeling like an airhead is part of pregnancy. Pregnancy brain is not a myth and many women feel dizzy and fuzzy by the second trimester. Again it is primarily due to the pregnancy hormones. Also, your pregnancy induced insomnia has a role to play in your forgetfulness. Sometimes it may frustrate you, but don't worry, by the close of the third trimester your sharp memory will regain its potential. Learn relaxation techniques: With a lot of changes affecting the course of your life, you may feel overwhelmed and anxious. Try to stay positive and practice relaxation techniques. You may join a peer group and do things together to keep yourself more focused. As your body is undergoing several changes to nurture your baby, you need a lot of rest to regain the lost energy. Yoga, pranayama and other breathing exercises will ease your discomfort and restlessness and make you feel calmer and more at peace with your baby and body. Always have a bottle of water handy: Dehydration is a real bummer during pregnancy. It may also affect your health and your baby's developments. Do not let yourself be dehydrated at any time. Always have a clean bottle of water handy and drink as frequently as possible. Make sure you don't drink just any water, as water-borne diseases can impact your baby adversely. Are you suffering from pregnancy insomnia? The back aches and leg cramps can keep you awake at night. Pregnancy insomnia is a common thing and affects a lot of pregnant women. But you need your rest and sleep. One good way to relieve the pain and discomfort during sleep is to keep a soft pillow or roller between your legs and keep your knees in a bent position. This not only provides you with more comfort but also makes you feel cozy for a good night's sleep. If you are a working woman, start making plans for your maternity leave and keep your company posted about your plan of action. Don't let sudden obstacles work wise affect your peace of mind. Stay happy and healthy and you will soon deliver a bonny baby in a few weeks time.